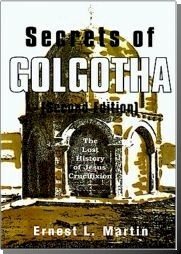 You can order Secrets of Golgotha here: Order Book . In 1996 Dr. Ernest L. Martin published the second edition of his book, Secrets of Golgotha: the Lost History of Jesus' Crucifixion presented here free in PDF format. In 1997 Dr. Martin began publishing his research on the true location of the Jerusalem Temples. In 2000 he published his book The Temples That Jerusalem Forgot. It presents powerful evidence that all the Israelite Temples were located south of the traditional temple mount site at the Haram esh-Sharif. After Temples was published, Dr. Martin and other researchers produced articles giving additional evidence supporting his work. That research is found on the "Temple Update Articles Index" page of this website. Due to his Temple research, the understanding in Secret of Golgotha about the site of the crucifixion and Jesus' tomb should be shifted further south on the Mount of Olives, directly east of the Gihon Spring across the Kidron Valley. The Temple was located above the Gihon at the top of the hill in the City of David. Dr. Martin's research on the correct site of Golgotha and the Temple have profound implications for biblical understanding of doctrine, history, symbolism, and prophecy. Chapter 11: Where Was the Sanhedrin Located? Chapter 19: Why the Temple of Venus? Chapter 28: What Difference Does it Make?